Who is Dave Guardala, anyway? Dave Guardala is a name that carries a lot of baggage today, but back in the early 1990s, his name was well-recognized in the North American saxophone world as a primo, custom saxophone mouthpiece maker. Guardala mouthpieces were used by some of the world’s most talented saxophonists. Even today, some of Guardala’s vintage custom pieces from the 1980s will fetch close to $2000. Today there are so many brands of mouthpieces carrying the Dave Guardala name that it is hard to keep them all straight. They are made—or were made—by different companies. But back when B&S forged their partnership with Dave Guardala he was not yet a convicted criminal, and his name was still well reputed within the North American saxophone community. It was this good reputation that allowed B&S to gain some traction in the US and Canadian marketplaces. Designed and made to the specification of US sax guru Dave Guardala. Produced in the heart of Germany’s renowned musical instrument district, an area famous for exceptional manufacturing. Technically engineered and handcrafted beyond the ordinary. By fulfilling the artists highest demands, these saxes achieve optimal response, superior intonation and tonal richness across all ranges. As a result they have found their way into the hands of professional musicians worldwide. Their popularity is due in part to their excellent acoustical properties, ease of performance, flawless mechanical quality and impeccable beauty – all resulting from decades of incomparable manufacturing processes, meticulous workmanship, continuous research and development, artist input, and the personal pride of each tradesman. Dave Guardala saxes are reminiscent of horns produced in an era when materials and craftsmanship were never compromised. A manufacturing philosophy that has long given way to mass production and bottom lines only to leave the purist empty. Dave Guardala saxes recapture that full, American sound of old, and create a better sound for tomorrow. Endorsing shown artists included: Branford Marsalis, Tom Scott, Kirk Whalum, and Michael Brecker. Composition: 72% formulated Copper alloy yellow brass. Construction: hand-made, with full rib post construction, and a hand-hammered bell. All rods are solid nickel silver with stainless steel screws; springs are tempered blue steel; and authentic Mother of Pearl key buttons are used throughout. Came standard with: custom hand-made French pads, by Chanu, with metal resonators. Extensive fine tuning key adjustment screws at all critical points. Classic Paris gold lacquer finish. Upper and lower key stacks are ergonomically designed for smooth, accurate and positive feel under the fingers. Black nickel plate with keys, key cups, key guards and all other moving parts in triple silver plate. Engraving on the bell is seen in bright brass highlights—as is the custom, hand carved engraving through the black nickel surface. 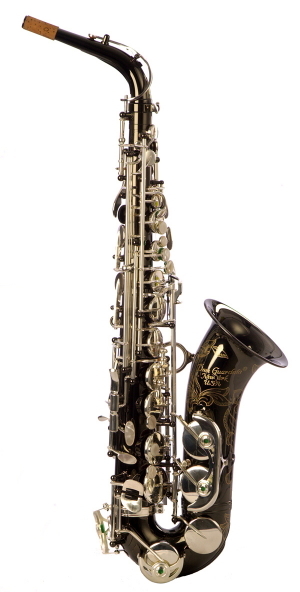 Hand engraving over the body, bell and neck in the same extensive floral style typical of Guardala saxophones. The floral engraving on the Dave Guardala Artist Series horns was not all identical. The following examples give you an idea of how beautiful, but different some of the hand engraving was. I don’t know how many different styles of engraving there were, or for that matter if custom engraving was available from B&S. NB. Although the engraving is the same as #34XX above, this is the only rose gold B&S of this model, or any I believe, I remember seeing. This horn was in Sarge’s personal collection. NB. This is another tenor from Sarge’s personal collection, and yet again it is a finish that was not listed in being available for this model. I don’t know if these finishes were only available in small numbers early on in the production of Dave Guardala horns—since both of these horns were from the first years of DG production—or if they were custom orders. Whatever the case, these are both very striking horns, which Sarge loved dearly, and played very seldom. Composition: 85% copper alloy (goldbrass), which B&S claimed offered more “brilliance, crispness and controlled resistance throughout all tonal ranges“. Construction: mechanical and design specifications are similar to the DG-400 and 500. Ostensibly the gold brass gave the Pro Custom a marginally brighter sound than the Artist Series. Clear lacquer over goldbrass with triple silver plated keys. Black nickel plate over goldbrass with triple silver plated keys. 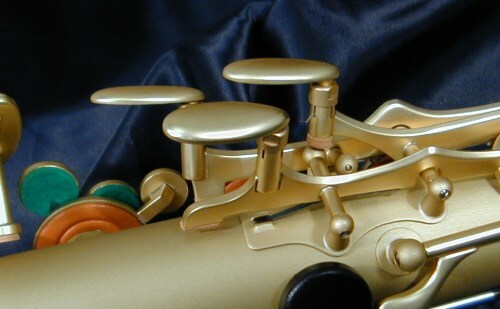 These Pro Custom Series, goldbrass horns were stamped as such by the right thumb rest. This tenor is DG-501BN #003102. This very special series of Alto and Tenor Saxophones represents the epitome of aesthetic design, mechanical genius and advanced brass alloy treatment. Once the player gets beyond the optimal sound performance of this instrument, he or she will be overwhelmed with the European hand craftsmanship that goes into each and every instrument. 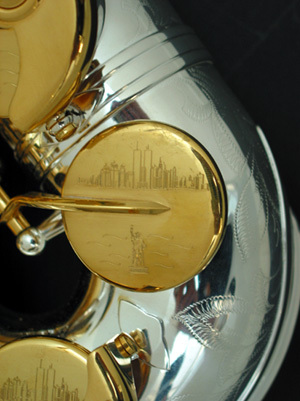 As the series title states, “NEW YORK”, each instrument is painstakingly hand engraved with traditional and historic pictorials of famous N.Y.C. landmarks. The Statue of Liberty, Central Park, Brooklyn Bridge and NYC Skyline are just a few of the scenes depicted on each instrument. Keys, bell, neck, body (back and front) are meticulously hand engraved to reflect NYC in an art form never before available on a musical instrument. Construction: mechanical and design features were similar to previously noted Dave Guardala models. This model came with blue steel needle springs; Chanu French pads; authentic mother of pearl key button inlays; and solid nickel silver rods. Black nickel plated with silver plated keys. Silver plated with all key work in gold plate. Hand engraving on keys, bell, neck, as well as the front and back of the body with New York City landmarks. To give you a better idea of what the engraving on these Dave Guardala New York Series horns looked like, here are a couple of examples. The first is alto DG-402BN # 010XXX. It sports engraving of the Twin Towers on its bell. The second is tenor DG-502SP # ?. It has has the Statue of Liberty proudly engraved on its bell. Composition: B&S used an advanced HI-PULSE brass annealing process on the Dave Guardala Earthtone Series. Construction: The company claimed that there was an improved smoothness and ease of register changes. The glass bead and fine sand texture were supposed to add resonance. Matt gold finish with gold lacquer inner bell. The finish is protected by a newly developed clear lacquer that cures to a fine matte finish. Extensively hand engraved on body, bell, bow, neck, and inner bell with the same extensive floral style typical of Guardala saxophones. Here is an example of a stunning Dave Guardala Earthtone Series tenor that Dave Kessler’s shop sold recently as a used horn. It is DG-503ET # 015149. It does not look like it was played at all. Very few used horns fall into the true “minty” category; this horn however, does. Unlike the Series 2001 that they were based upon, the DG horns did not seem to improve markedly over their production run. 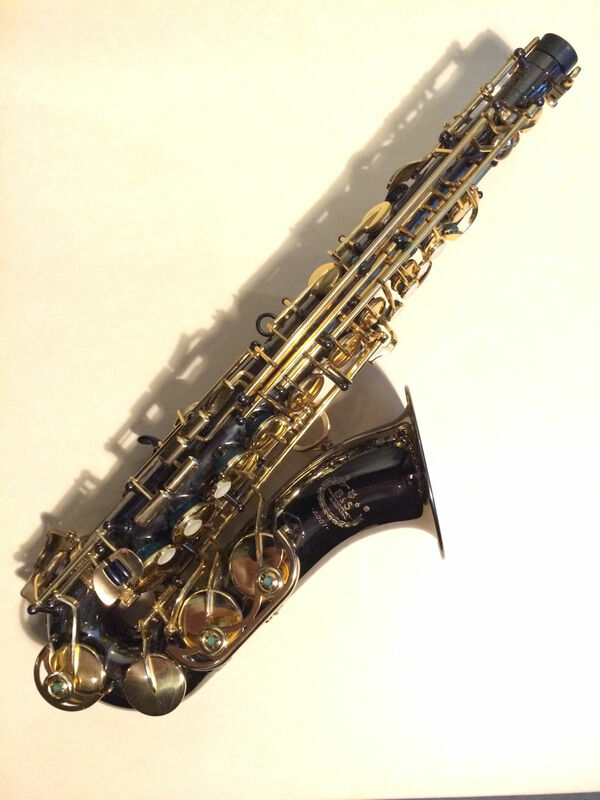 While there may have been very subtle changes that did not get noted on the dealer’s website, we know for a fact that the Dave Guardala saxophones did not get any of the obvious improvements we saw over the Series 2001’s production run. Improvements such as: adjustable left palm keys, or an anti-stick G# key. 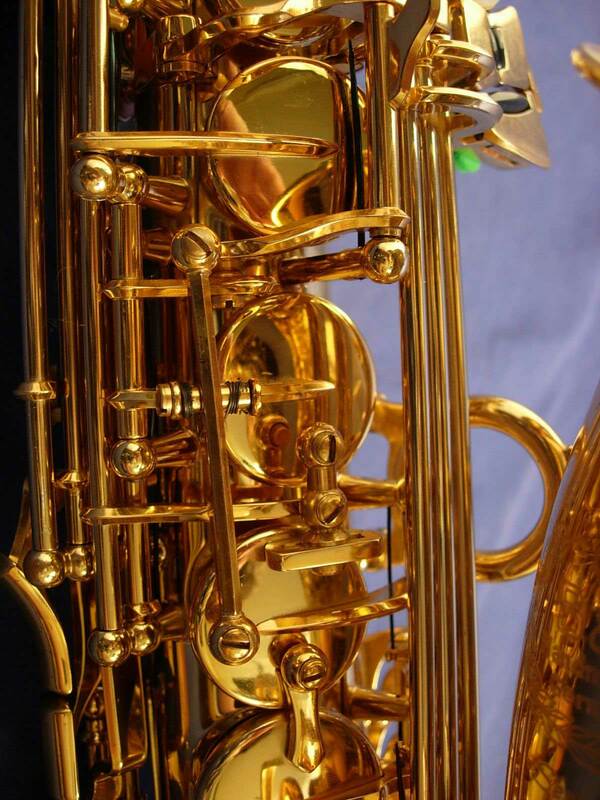 Nonetheless, the Dave Guardala saxophones still have a loyal following, and some—especially the New York Series with the Twin Towers engraving—have maintained their value quite well. These were lovely instruments that were built extremely well. Why Stephen Howard speaks so poorly of the one he play-tested is a bit of mystery. Remember Steve, AKA “Sarge”, Stransky from World Wide Sax owned two in his personal collection, and he only collected the best saxophones. 1 In Saxophone: Ein Kompendium, by Uwe Ladwig, Second edition 2012, p. 150, the author states production of these horns ended in 2000. Some conflicting information can be found on an archived copy of saxophones.co.uk’s Dave Guardala saxophone page however. On an August 5, 2004 screen grab it states that DG production has now ceased. 2 September 18, 2009: Guardala Receives Four-Year Sentence in Music inc.
4 The following model and finish information (as well as photos, unless cited differently) all come from archived saxophones.co.uk webpages.